Bruce Cameron (drill operator) and small acreage landowner Sue Henry check drill as a seeding job begins. 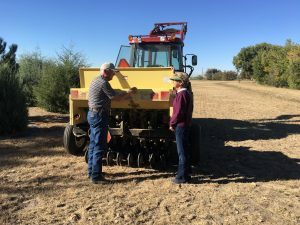 The West Greeley Conservation District offers a program to seed or re-seeding native grasses in pastures, on small acreages and in other areas. The aim is to aid water retention, prevent soil erosion and provide wildlife habitat. Landowners are responsible for obtaining and paying for seed. WGCD staff assists landowners in selecting an appropriate seed mix based on soil analysis and/or recommendations from NRCS. Native grass species such as blue grama, buffalo grass, sideoats grama, and western wheatgrass are highly recommended. WGCD staff uses a 5-1/2-foot Truax No-Till Grass Drill, which works best for on sites of 15 acres or less. Requests for more than 15 acres are considered on a case-by-case basis. Locations within the District receive priority. Contact Liz Schneider, Conservation Technician, 970-356-8097, ext. 142 for details, pricing, or to obtain a contract or to schedule an appointment.